The Geomorphology of Upland Peat offers a detailed synthesis of existing literature on peat erosion, incorporating new research ideas and data from two leading experts in the field. Martin Evans is a senior lecturer in geomorphology at the University of Manchester. Jeff Warburton is currently a reader in geomorphology in the Department of Geography at Durham University. 1.1 The aims of this volume. 1.2 Terminology, definitions and peatland geomorphology. 1.2.2 The Physical and geotechnical properties of peat. 1.3 The geography of blanket mire complexes. 1.4 Patterns of peat erosion in space and time. 1.4.1 The onset of peat erosion. 1.4.2 Direct observation of the onset of erosion. 1.5 Causes of peat erosion. 1.6 A brief history of the evolution of peatland geomorphology. 1.6.1 Accounts of erosion in the natural science tradition. 1.6.2 Descriptive accounts of widespread peat erosion. 1.6.3 Quantitative observations of blanket peatlands. 1.7 Structure of this volume and the peat land system model. 2. The Hydrology of Upland Peatlands. 2.2. Controls on water movement in peatland systems. 2.2.1 Hydraulic conductivity of upland peat soils. 2.2.2 The diplotelmic mire hypothesis. 2.2.3 Groundwater flow in upland peatlands. 2.2.6 The Water balance of ombrotrophic mires. 2.3 Geomorphology and the hydrology of upland peatlands. 3.1.1 Monitoring sediment production using erosion pins. 3.2 Sediment production as a control on catchment sediment flux. 3.3 Evidence from field observation. 3.3.1 Climate correlations with trap data. 3.3.2 Direct observations of surface change. 3.4 Evidence from controlled experiments. 3.5 Timescales of sediment supply. 4. Fluvial Processes and Peat Erosion. 4.2 Gully erosion of blanket peat. 4.2.1 Gully morphology and topology. 4.2.2 Processes of Gully erosion. 4.3 Erosion and transport of peat in perennial stream channels. 4.3.1 Production of peat blocks by fluvial erosion. 4.3.2 Transport of peat blocks in stream channels. 4.3.3 The fate of fine peat sediment in channel. 4.4.1 A conceptual model of sediment dynamics in eroding blanket peatlands. 4.4.2 Sediment yield, sediment supply and assessing catchment erosion status. 5. Slope Processes and Mass Movements. 5.2.1 Limits to the stability of peat on slopes. 5.2.2 Creep on peat hillslopes. 5.3 Morphology of rapid peat mass movements. 5.3.4 Secondary tension and compression features. 5.3.5 Bog burst and peat slides – are they different?. 5.4 Mechanism of peat failure. 5.4.1 Speed of failure and movement. 5.5 Significance of surface hydrology in peat failures. 5.5.1 Water content and pore pressures. 5.6 Stability analysis and modelling of peat mass movements. 5.7 The changing frequency of peat mass movements over time. 5.8 Summary and overall framework. 6.2 Wind erosion in the uplands and the significance in peatland environments. 6.3 Mechanisms of wind erosion. 6.4 The significance of wet or dry wind erosion processes. 6.5 Direct measurements of wind erosion of peat. 6.7 The significance of wind erosion for landscape development in upland peatlands. 6.8.1 Further research – an agenda for pluvio-aeolian studies of upland peat. 7. Peat Erosion Forms – from Landscape to Micro-relief. 7.2 Macroscale – Region / Catchment Scale. 7.3 Mesoscale - Slope-Catena Scale. 7.4 Microscale - material structure scale. 7.5 Linking the geomorphological and the ecohydrological. 8. Sediment Dynamics, Vegetation, and Landscape Change. 8.2 The effect of peatland dynamics on long term sediment budgets. 8.3 Mass balance evidence of patterns of long term erosion. 8.4 Re-vegetation of eroding peatlands. 8.4.1 Artificial re-vegetation of bare peat surfaces. 8.4.2 Natural revegetation of eroded landscapes. 8.5 Controls and mechanisms of natural re-vegetation. 8.5.1 Extrinsic controls on re-vegetation. 8.5.2 Intrinsic controls on re-vegetation. 8.5.3 Eriophorum spp. as Keystone Species for Re-vegetation of Eroded Peatlands. 8.5.4 Geomorphology, ecology, and 'erosion-regeneration complexes'. 8.5.5 Re-vegetation dynamics and long term patterns of erosion. 8.6 Stratigraphic evidence of erosion and re-vegetation. 8.7 The future of blanket peat sediment systems. 8.8 Changes in pollution climate. 8.9.2 Increased summer and winter storminess. 8.9.3 Changes in the growing season and vegetation. 8.9.4 Overall response of the peat land system. 8.10 Relative importance of peat erosion in wider upland sediment budgets. 9.1 Implications of widespread peat erosion. 9.2 Upland peatland erosion and carbon budgets. 9.2.1 Case Study Example: the Rough Sike sediment-carbon budget. 9.3 Release of stored contaminants from eroding peatlands. 9.4 Restoration of eroded upland peatlands. 9.4.3 Implications of the landsystems model and sediment budget work for restoration. 9.5.1 The nature of upland peatlands. 9.5.2 Geomorphological processes in upland peatlands. 9.5.3 The future of upland peatlands. 9.5.4 Representativeness of the peat land system model. 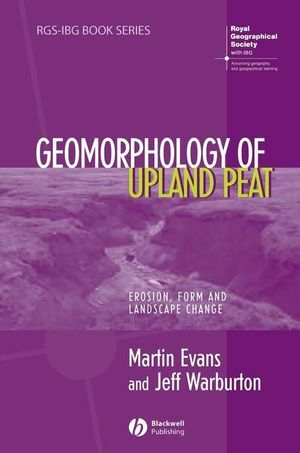 "This book is a timely, comprehensive and authoritative overview of recent research on peatland erosion and geomorphological change. It addresses a vacant niche in the wetland literature and takes forward the peatland research agenda in new and interesting directions." "Peat is one of our most precious natural resources. This important textbook takes us through the many challenges of researching, understanding and restoring peatlands. Timely, instructive and comprehensive, this book has the distinction of being essential to academics as well as practical conservationists concerned with peat."